← Monster Jam was spectacular! 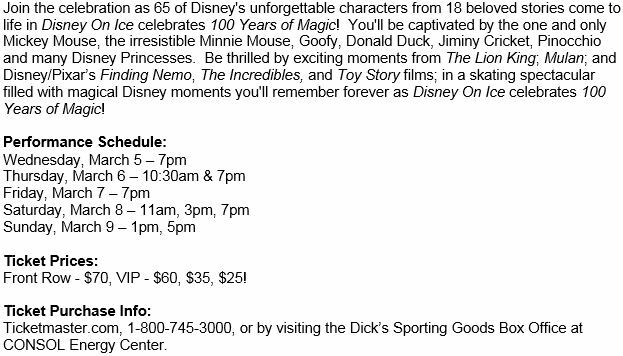 Pittsburgh, PA: Disney On Ice is coming March 5-9th, Special $12 ticket coupon, PLUS enter to win FREE tickets! 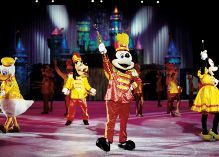 Sing along with 24 of your favorite Disney songs when Disney On Ice celebrates 100 years of Magic arrives in Pittsburgh at the CONSOL Energy Center, March 5-9, 2014. We are offering a Ticket giveaway for a family 4-pack to the Friday night performance, March 7, 7:00pm. Enter HERE. Must be 18 to enter, one entry per day. USFG will randomly choose winner on Tuesday, 2/25 at 5pm and announce via social media and email. Click HERE for the special $12 offer. 1. What does Pinocchio wear in his hat? 2. According to the Blue Fairy, what kind of wood was Pinocchio made of: oak, maple or pine? 3. 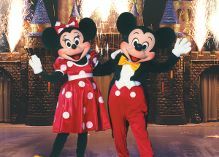 What character always struck the gong at the beginning of the Mickey Mouse Club: Dumbo, Donald Duck or Goofy? 4. According to the Beast, where is the only place in the castle Belle is not permitted? 5. When was the United States Figure Skating Association founded? 6. In Toy Story, what toy is the song “You’ve Got a Friend in Me” about? 7. What does the Beast give Belle when she leaves the castle? Answer: The Beast gives Belle a magic mirror so that she will “always have a way to look back and remember” him. This entry was posted in Coupons, Giveaways. Bookmark the permalink.